Never mind that it’s Meatless Monday: I’m eating Kale because I LIKE it! 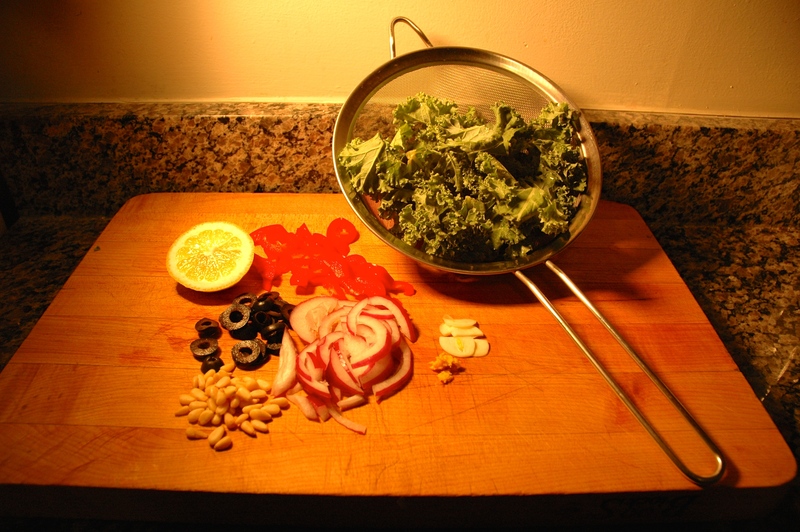 I like Kale–it’s inexpensive, easy-to-prepare, crunchy-chewy and flavorful. If you’ve hated Kale, perhaps you’ve swallowed it as super-food medicine–dried into a revolting substitute for potato chips, or blended into a gagging substitute for a refreshing drink. it’s got a bitter bite to it. I happen to like bitter — Brussel sprouts, grapefruit, Campari, broccoli rabe, black coffee. I enjoy enlivening my tastebuds by mixing up sweet, salty, sour, bitter, umami, hot. If you don’t relish a powerfully bitter sensation on your tongue, add some honey to this recipe and give Kale a chance. The dish is so pretty–it’s worth making it just to see it on your plate. And it tastes yummy. Heat a large sauté pan over medium-high heat until you can feel the heat rising from it when you hold your palm 3-4 inches above the surface. Add the olive oil and swirl it around. It should shimmer. Sprinkle in the pine nuts, red pepper and onion and stir fry for 1-2 minute until the nuts start to brown and the onion begins to turn golden. Give the kale a quick rinse and add it to the pan with a bit of water clinging to its leaves. Stir. Add the lemon zest, olives, and squeeze the juice from the lemon wedge over. Add the honey if you don’t love a bitter zing. Stir. Zip it up with heat, if you’re a chile-head. Stir until just wilted. Serve (goes smashingly on a plate with corn pudding and delicious Italian-style white beans). Be aware of another Kale truth: eating too much Kale will make you embarrassingly gassy. This is nature’s revenge against people who consume huge quantities of a supposed miracle food on the naive assumption that they can make themselves live forever-young. Nature abhors a common-sense-vacuum. Pretty as a picture Kale! What’s your opinion of Kale? I’ve not become a huge fan of mustard greens, but I figure that’s because I haven’t eaten them often enough. The French rule is that if you eat something 7 times, you’ll develop a taste for it (if you’re willing…). I’ll try them in Minestrone. And I agree–I DO like meat, but it’s never as interesting veggies are. I’m not sure what that “thing” is that makes young people (and some people no matter what age they are) afraid of experiencing new tastes. Incredibly, I was an horribly finicky eater as a child, and everything I disliked gave me a gag-reflex. I really wanted to be “good” and like everything that was given to me. I suppose that’s why I eventually overcame it. Now I’m the most adventurous eater I know (and I know a lot of adventurous eaters). But I’ve never met anyone who has fewer “dislikes” than I have. I LOVE food — I’ll eat almost anything as long as it’s not rancid or spoiled or nonfood (which a surprising amount of the stuff in the groceries stores, masquerading as food, is). And I love discovering new tastes or combinations of taste. Yay, kale. I like the chips, although they are a bit expensive if one buys them. I love it stir fried with garlic and ginger. Your recipe sounds great. I also like the idea that one needs to try something seven times to see if one might like it. And it’s always helpful to be reminded about the wisdom of moderation…. I like kale with bacon. Yum! I’ve been known to add a little bacon to my greens. Yum is right! I love kale as well! I’m also a fan of collard greens which have a similar bitter taste to them. I’ll have to give this recipe a shot! Collard greens are mighty fine, but my favorite of all is turnip greens, with a titch of malt vinegar, molasses and Frank’s hot sauce! Mmmmmm-good! I hope you like the recipe. It’s a nice twist on the bitter-greens theme. It does look delish Tracy and for a while it was the latest rage in these parts. Cauliflower is now holding that honour! Same here–cauliflower is the new kale. But I’m always at least a year, sometimes 5, 10, or 20, behind a trend. There’s just something in me that resists a trend. Or maybe I’m ahead of trends. I’ve been all over cauliflower for the past five years. My favorite way is roasted. Fabulous! I love them cooked and mashed with potatoes and baked in Shepherd’s pie! I like the flavour but the stalks can be a bit tiresome. 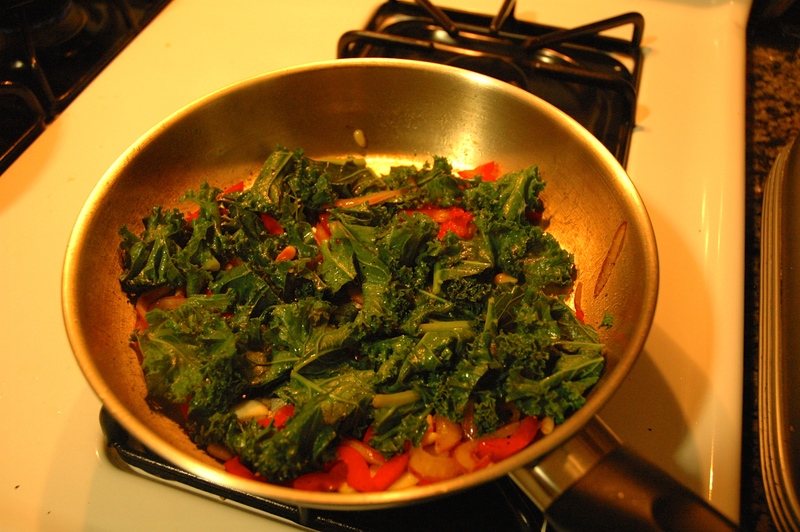 As with cabbage, I think kale is better sauteed than boiled, so I must try this recipe out. Having shelled out for having my garden done and all sorts fixed on my house this month, I am certainly looking for cheap, nutritious, tasty recipes. I like kale, even in a smoothie! Not a big fan of the chips, and I’m not a gourmet cook – the simpler the better for me! My favorite is to steam it lightly like spinach and put a little Kerrygold Butter on it! I have that as part of my breakfast. Smart you– incorporating vegetables into the first meal of the day. I’ve done that now and then–and you’ve reminded me to do it more often. I just added another delicious kale recipe, Tracy, so thank you very much. I’m a kale fan, too, but up until now my favorite dish was spritzing with olive oil, sprinkling with sesame seeds, sea salt and dill weed, and baking until crunchy. Years before it became popular for it’s many tremendous health benefits, kale was an accident my mother planted in her garden. Mostly she fixed it as she would fix fresh spinach, cooking until soft with vinegar, butter and salt. She liked it very much, but the rest of the family didn’t much care for it. I’m going to try your way, too. I seriously can’t stop eating this kale with a touch of honey. Of course, more is recommended when serving children–they rarely can handle bitter tastes. I’ve cooked it your mother’s way, with malt vinegar and adding just a hint of molasses. That complements corn bread, pinto beans and, of course, a bottle of good hot sauce must be on the table. I agree that it’s an acquired taste. I had already acquired a taste for collard greens and turnip greens before I tried kale–and it was love at first bit. If you get stuck HAVING to eat kale, make sure and use plenty of honey. It really changes the kale experience. I love kale! And I even think I could tackle this recipe…! Thanks Tracy. You’re welcome — it IS an easy recipe. Thank you so much for sharing your recipe. I’ll definitely try it out. Thank you for stopping by. I’ve checked out your blog and will be following it. My husband and I love Indian and Parsi food, and I try to cook it at least once a week (its ‘s nutritious and tasty!! )Therefore I’m always looking for new ideas.